"Based on the positive reactions we have received to the D-Arts Mega Man X upcoming release, we are currently planning for additional Mega Man releases in the D-Arts line. Zero is certainly under consideration for a future release." Was there really any doubt? Still, this is great news! So, any characters in particular you'd like to see rendered in high quality plastic? It remains to be seen if future figures will be strictly X series related, but it really couldn't hurt to be hopeful for anything. From here on out, Adam will keep us in the loop regarding any upcoming release announcements. I wonder if they'll start making ones for characters from the Classic, ZX series or Legends. HEY. How about reminding everyone that the Reaverbot Contest is coming to an end tomorrow? Only X series? :\ I want to see Harpuia and the other Generals. I want an Iris model. I've waited years for one of those. Axl and Zero are on my list. Any more X figures will be promptly purchased upon release. Do your thing, Bandai! Yes! The Tribute entries have to be in tomorrow, too. Hah! Like they'd give X a figure and not Zero. Bandai needs to make every X character ever because I would buy every single one. That X figure is so amazing, I'd trust Bandai to make any MM character. Give me iX, or nothing. I want a Vile MK1 figure. 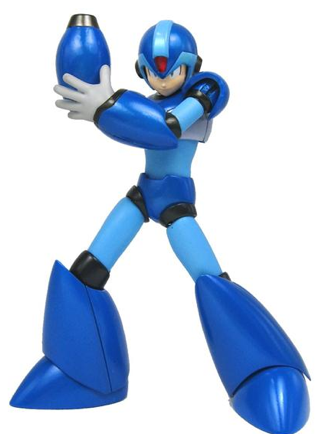 I suppose hoping for any figures from the true MegaMan series would be hoping for too much. Vile especially would be cool IMO. Maybe X4's Colonel. Awesome, maybe they can get figures of the zx series because that was awesomw the combination of x and z. So... Did anyone even DOUBT if Zero was gonna be made?